by Lucian W. Stone, Jr.
With the recent horrific events in New York, there are many who are asking just what it is about Islam that causes it, wherever it is actually put into political practice (e.g., Iraq, Iran, Somalia, Palestine, Libya, Syria, etc, etc [sic]) to be associated with such sub-human barbarism. Again and again we are told that these represent “aberrations” from the true spirit [of] Islam, and that the vast majority of Muslims in the world have somehow gotten their own religion all wrong. Now, I have no doubt whatsoever that Nasr himself is not an evil or violent man. However, what he fails to understand is that this type of disgusting rhetoric is embraced by other Muslims as a warrant for genocide. In other words, if something is “essentially evil,” for example, Naziism, we are not only permitted to destroy it, but morally compelled to do so. Bin Laden is in full agreement with compunction in slaughtering thousands of innocents, but is utterly convinced that he has advanced the cause of good (and God) in the world. How could it be otherwise? Obviously my reprieve was short lived as this exclamation cast me back into serious reflection upon the conditions leading to the terrorist attacks and the heavy air of the aftermath. Though I hardly agree with a single utterance expressed by the author in his/her rant, it nevertheless did provoke penetrating questions of my own, particularly with respect to Traditionalism. At the heart of these questions, admittedly, is my own self doubt about my personal interaction with Traditionalist texts and lived Traditionalism. That is, from the outset let me make clear that I personally—though baptized and brought up in a traditional Roman Catholic home—like many American (Western) youth of my generation, broke away from tradition and embarked upon my private “intellectual” journey. (Little did I suspect, then, that it was in fact a spiritual journey that I was undertaking!) Along the way I embraced radical individualism (and its bedfellow, relativism), endured a stint wavering between atheism and agnosticism, have and still do intensely study the history of Western philosophy, found “comfort” in nihilism, and due to my intellectual curiosity bringing me upon certain traditional texts (first in the texts of Buddhist, Taoist, and Hindu philosophies, and lastly in those of the three Abrahamic traditions, especially Islam), have come full circle, some might say, in exploring Traditionalism once again. However, this journey is not complete in that I remain at a distance from Traditionalism and thus far have merely academically tried to come to terms with it. Given this personal aside, a fundamental question has arisen with respect to Traditionalism in general and in regard to the esoteric dimensions in particular. In short, I am perplexed by the act and purpose of Traditionalist publications (such as the journal for which I am writing this article, Sacred Web). Several direct questions stem from this general concern: 1) Granting our current historical context in which there are relatively few people who are able to read and interpret Traditionalist texts, why do Traditionalists publish them, thereby granting the inept access to the texts? ; 2) Branching out from the last clause in the prior question, in full knowledge that either these texts will be misinterpreted by some within the Traditions themselves—by those who have distorted or unlearned opinions thereof (which can frequently be accounted for by tracing the influence of Western, non-Traditional sources) and who oftentimes have ulterior motives (e.g., political aims)—or by those outside of a given tradition, or Traditionalism in general, who will exploit the texts for their own desired end, why do Traditionalists publish? ; 3) In light of the emphasis of the esoteric or interior dimension of Traditionalism emphasized therein, which necessarily requires intense discipline and study, why make available these sacred texts for an otherwise ill-suited mass audience? ; and 4) Should not the Traditionalists insist on the initiatory rites and practices required of Traditionalism before exposing these potentially unintelligible, and therefore dangerous, teachings to the individual pupil, yet alone a mass audience? In sum, what could possibly be the purpose or desired end for the Traditionalist in making public these texts which require rigorous guided study and practice in order to be fully comprehended? This essay, which I undertake in earnest humility, is both an effort to examine my own personal interaction with Traditionalist teachings and to weigh this out in respect of what I hope to be an otherwise objective, yet empathetic, academic inquiry. In the end, I do not have the answer to these questions. I already laid bare my guilt of not being a Traditionalist personally, thereby disavowing myself the ability to definitively answer these questions. Rather, it is my hope that by way of this initial inquiry I will spark further dialogue concerning these matters—and other related ones which I may not even be aware of yet—pertaining to the nature of transmitting Traditional texts (as well as exegetical works and commentaries thereof) in a fundamentally distorted modern world, for an ill-equipped modern audience. The domain of mythos, to recap, is primary and in the deepest sense grounds even logos. To use Rudolph Otto and Mircea Eliade’s terminology, it is in the myth that the “heirophany” is revealed.7 Thus, necessarily all other modes of obtaining knowledge, grounding meaning and so on, must be aligned in light of mythos, including logos—though, as we will shortly see, it has its particular place and purpose as well. Furthermore, it is within the mythic mode which the esoteric realm of a given tradition is experienced. It cannot be stressed enough that this, for the Traditionalist, is not a strict bifurcation. Instead, this distinction is descriptive of two necessary modes of interaction with our world and the deeper, hidden meanings of life. That is to say, they both play an essential role in the life of the individual and society. It is when one or the other supercedes and dismisses the other that trouble arises. This is precisely the case, as described by Armstrong in her study, in the contemporary religious landscape driven by the excessive emphasis on logos to the detriment of all mythoi. Nowhere is this more evident than in the politicization of esoteric doctrines via a logos-centric interpretation. One of the fascinating and, frankly, perplexing themes highlighted throughout Karen Armstrong’s detailed survey of the Jewish, Christian, and Islamic traditions in a historical fashion, with constant reminder of the distinction between mythos and logos, is the assimilation of mystical doctrines and symbolism in the exoteric or external religious realm—especially with respect to political aims and/or propaganda. All three traditions’ mystical orders warn that they should take heed of the imminent dangers in exposing their ideals and practices to an uninitiated audience. For example, “Other Muslims were able to explore fresh religious ideas and practices in the esoteric movements,” Armstrong writes, “which were kept secret from the masses because their practitioners believed that they could be misunderstood.”9 These potential misunderstandings are a direct effect of the domineering logos-centric view adopted largely in the modern era. We see then that this literalistic mode of interpreting the exoteric doctrines of sacred texts resulted in the further separation from the sacred origin of Tradition in favor of a more subjective, individualistic appropriation. In other words, instead of recognizing the non-human, eternal, and infinite nature and source of mythos, the hubris of mankind extended itself to analyzing and “reforming” the various traditions under the rubric of logos, reason. If this is historically true for the less symbolically rich external dimension, then one can only quiver at the thought of what might come about as a result of a similar rational “exegesis” of the mystical or esoteric teachings. Therefore, from the outset let there be no mistake, the esoteric, or initiatic domain never has external—especially political—aims in mind. As Guénon writes, “All initiatic realization is therefore essentially and purely ‘interior’…”15 It focuses on the inward (or vertical) movement toward the divine origin, whereas the exoteric functions on the horizontal plane. Initiation, however, does involve a communicative aspect. Who is to say that Jane or John Doe who purchases a copy of a given Traditional esoteric text is indeed “qualified” to receive the transmission? There are no means inherent in the process of publishing to ensure that these conditions are met by those who will be engaging Traditionalist publications. So, one might ponder, what then is the desired aim, or rather, what good can come about through making public the interior dimensions of Traditionalism to an unequipped general audience? Given that the “initiatic chain” necessitates first that the student be an adherent of a Tradition and that this person also possess the proper abilities to be initiated, then what role do printed materials in the vein of Traditionalism play in propagating these teachings? To further speculate as to the nature and effectiveness of Traditionalist publications, web sites, and so on, let me once again reference Guénon in his proclamation that in its strictest sense, initiation requires direct (in the sense of actually being in the immediate presence of a spiritual authority), guided, and, yes, oral transmission. What is most mind boggling from the starting point of the phenomenon of politicizing the esoteric teachings is precisely this fundamental error of externalizing the interior. It is so obvious, especially as one might presume from within a Traditionalist perspective, that laying bare the esoteric teachings/writings and/or offering “exegetical” accounts thereof to the public arena, in which the sincerity and preparation of the pupil cannot be guarded, is begging for problems. Similar types of hermeneutic appropriations of mystical/esoteric texts have lead to both “fundamentalist” movements within these traditions as well as complete misunderstandings and dismissals from those working outside of Traditionalism per se. They hold in common a language for analysis founded upon logos. Though I made mention in a few instances above regarding the use of publications to transmit Traditionalist ideas in the shadow of such blatant abuses, let me move now to my conclusion during which I hope to sum everything up and refocus my question. I begin this concluding section, which in the end analysis will not proffer a strict conclusion as such but rather open questions for future dialogue, speculating upon a possible answer to my own question. In other words, what may indeed be the impetus for the Traditionalists in making public their esoteric texts and commentaries to the free press? My first, and perhaps most correct, assumption is that it is a direct response to the attempts by non-Traditionalists to translate and explicate these texts which they “discovered” during their academic or scholarly pursuits. That is, it would seem reasonable enough for Traditionalists to offer their own internally consistent account of Traditionalism in the face of outside expositors—which have been called and criticized as “Orientalists.”24 If, however, Traditionalists publish in order to circumvent or combat the rampant foibles of both/either the so-called expositors of esoteric doctrine and/or the modern mindset because this is the battlefield drawn by these foes, then I am concerned whether or not they themselves have become cogs in this machine—participants in the race to bombard the public with conflicting and too frequently skewed ideals. 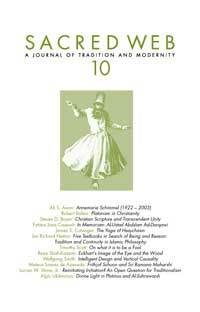 Here an aside reference to the work of Jalal Al-e Ahmad may be of use. In his influential text Gharbzadegi (Weststruckness), in which he outlines the relative conditions and underlying perspectives of the “East” and “West,”25 Al-e Ahmad declares, “It’s obvious that as long as we only use machines and don’t make them, we’re Westruck. Ironically, as soon as we start building machines we’ll be afflicted by them, like the West, which is now suffering from the effects of runaway technology.”26 Admittedly, Al-e Ahmad’s viewpoint is not primarily derived from Traditionalism per se (in fact he was mostly influenced by Marxism and his involvement with the Tudeh party), however, this paradoxical conundrum is applicable to the topic at hand. That is to say, according to Al-e Ahmad, the West has thrust its unchecked, uncontained technology onto the world—especially within the arena of the world market.27 Despite the philosophical, ethical, religious, cultural, underpinnings and their consequences, the East, in essence, is left without a viable choice in confronting this advance upon its own collective consciousness. If you will allow me an Americanism, “You’re damned if you do, you’re damned if you don’t!” In other words, if the East simply remains passive in the face of the West, then it is exploited for its natural resources, its cheap labor, and its marketability. If, on the other hand, it joins the race to produce, then its culture, religious values, etc., fall victim to the inherent value system within the West’s technological advance—namely, solely logos without regard (and with contempt) for mythos. Myth looked back to the origins of life, to the foundations of culture, and to the deepest levels of the human mind. Myth was not concerned with practical matters, but with meaning. In sum, by publishing in order to combat the folly rendered to Traditionalism, it enters into a vicious cycle by being cajoled into meeting Modernity explicitly at the level of logos instead of mythos. The book review which instigated this inquiry, as previously alluded to, can readily be dismissed on many grounds. I will not entertain all of them here. Instead it should be clear where the fundamental mistake is made—the author relying on logos took Nasr’s statement completely out of context and ciphered it through his/her rationalistic/scientistic analysis. Such an interpretation is flatly incorrect and illustrates a lack of understanding and willingness to put forth a modicum of sincere effort towards dialogue. Nevertheless, it can rightly be asked, I believe, of the Traditionalists, like Nasr, knowing full well that the majority of your readers will be approaching your texts with such prejudices and biases, why continue to use this language that so readily falls into their critiques? Moreover, if the answer rests in the inability or unwillingness to compromise the symbolic language of Traditionalism, then why open this up to the general public? I am of two minds on this subject. On the one hand, in light of the above, I can fully see that there is indeed something essentially correct in not disseminating these teachings for precisely the reasons given. In other words, it is counterintuitive to grant a mass audience the inward/esoteric Traditionalist teachings. For certain they will be manipulated for improper aims. On the other hand, however, my own personal experience is thankful for these publications and the authors of such careful and thoughtful elaborations such as Nasr, René Guénon, and Frithjof Schuon, to name but a few. In fact, it was through their works that I was able to personally arrive at this present juncture on my journey. That is, I was not very different than the author of the book review too long ago. But, through my initial exposure to translations of primary esoteric texts, I pursued to further my understanding in these “exegetic” texts and it was only through them that I have reached the level of comprehension I now have. In sum, I am torn between what appear to be imminent, even unavoidable, dangers presented in the use of publication, and the hope for the few instances in which it works in evoking a Traditionalist response. I finish, then, by restating my question: What is the purpose of granting the public access to Traditionalist texts, either through translations of primary sources or via secondary commentaries? Does not the participation in the printed medium circumvent the necessary conditions in initiatic transmission? Finally, should not the Traditionalists reinitiate initiation by returning to the traditional mode of transmission in the form of direct, student to teacher guidance and thus avoid the pitfalls that go hand-in-hand with the printed word? 1 Plotinus, Ennead II 9, 16, 43-55. Translated and quoted in Pierre Hadot, Plotinus or The Simplicity of Vision, trans., Michael Chase (Chicago: University of Chicago Press, 1993), pp. 35-36. 2 Lewis E. Hahn, Randall E. Auxier, and Lucian W. Stone, Jr., (Eds. ), The Philosophy of Seyyed Hossein Nasr Library of Living Philosophers Volume XVIII (LaSalle, IL: Open Court Press, 2001). 3 I suggest that anyone wishing to check this citation and see it for him/herself simply to go to amazon.com and do a book search for “Philosophy of Seyyed Hossein Nasr.” Please note that the author’s name is not given; rather it merely states “A reader from Calabasas, CA USA.” It should also be noted that the author gave only a one star rating out of a possible five stars for the volume under review. On a more positive note, only 2 of 31 people who read this review (as of 10/8/02) have found it helpful. 4 I, for one, am thankful that this research and the publication thereof were completed before the terrorist attack of Sept. 11th, 2001. Else, one could imagine the charges of “apologeticism” or even worse, given the growing polemical rhetoric infusing the media and political jargon, being a “sympathizer” with religious zealots! 5 Karen Armstrong, The Battle for God (New York: Alfred A. Knopf, 2000), pp. xiii. 7 See Mircea Eliade, The Sacred and Profane: The Nature of Religion, trans. Willard R. Trask (New York: Harcourt Brace & Company, 1987), p. 8ff. 12 Please bear this in mind as it pertains to the dissemination of Traditionalist texts to a mass audience via publications, etc. 14 René Guénon, Perspectives on Initiation (Ghent, NY: Sophia Perennis, 2001), p.20. 20 Suhrawardi, The Philosophical Allegories and Mystical Treatises, trans. W. M. Thackston (Costa Mesa, CA: Mazda Publishers, 1999), p. 115. 21 Ibid., p. 115, fn. V.
23 I implore you to carefully read Armstrong’s book already cited for a detailed account of the “fundamentalist” conflation of mythos and logos, particularly as it historically manifested in lieu of true—Traditional—mystical orders. 24 See for example Edward Said, Orientalism (New York: Vintage Books, 1979). For a specific example of this in René Guénon’s work, see Perspectives on Initiation, p. 7, where he criticizes R. A. Nicholson’s translation of tasawwuf as mysticism and the consequences thereof. 25 Just as Nasr (op. cit.) clarified that for Suhrawardi the geographical symbolism is not to be taken literally, Al-e Ahmad likewise states, “The only thing left to say here is that in my view, East and West are no longer two geographical concepts as such….West and East have neither a political nor a geographical meaning. Instead they are two economic concepts.” Jalal Al-e Ahmad, Gharbzadegi (Weststruckness), trans. John Green and Ahmad Alizadeh (Costa Mesa, CA: Mazda Publishers, 1997), p. 12. 26 Jalal Al-e Ahmad, Gharbzadegi (Weststruckness), trans. John Green and Ahmad Alizadeh (Costa Mesa, CA: Mazda Publishers, 1997), p. 16.